Over 100 of the world’s most beautiful women are heading for South African shores, after it was chosen to host the Miss World pageant for the sixth time since 1992. After successfully winning the bid to host the Miss World 2008 event, Johannesburg will play host to the prestigious event that brings together some of the world’s most exquisite women. The event, originally scheduled to take place in Kiev, Ukraine, was moved to South Africa amongst fears of political instability in Ukraine’s neighbouring South Ossetia and Russia. As a precautionary method, Miss World Limited company decided to invite several countries to submit proposals to host the pageant. This will come as a huge boost for tourism in Johannesburg. Lindiwe Mahlangu, CEO of the Johannesburg Tourism Company says a number of selected cities were invited to submit proposals to host the event. Each country had to present their proposal before Morley. She says the Miss World Limited company is excited at promoting Johannesburg before the start of the pageant. “We look forward to working with the City of Johannesburg to promote this world-class city in over 180 countries during our one-month Miss World Festival,” she said. This will be the sixth time that the Miss World Pageant is held in South Africa, and a first for Johannesburg. The pageant was first held in South Africa in 1992 at the world-famous Sun City resort, in the north-western region of South Africa. That year, Russia’s stunning beauty, Julia Kourotchkina, scooped the crown. The event was hosted at the same venue until 1995. The global beauties returned to South African shores in 2001. 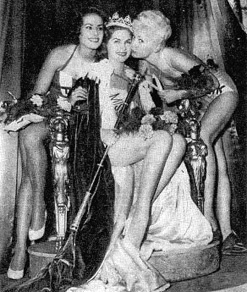 Two South African delegates have had the honour of being crowned Miss World, with Penelope Coelen and Anneline Kriel claiming the crown in 1958 and 1974 respectively. 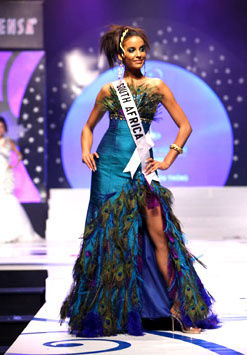 This year, the reigning Miss South Africa 2007, Tansey Coetzee, will represent the host country at the event. The 23-year-old Johannesburg native has a degree in corporate communication from the University of Johannesburg and has had a busy tenure, making several guest appearances at charity events. She says she knows that living her dream is a huge accomplishment as many other little girls, just like her, aspire to be Miss South Africa. Commenting on the legacy that she would like to leave behind at the end of her reign, Coetzee said she would like to be remembered as an individual who encouraged others to make a difference within their communities. According to Coetzee, she would like to dispel the stereotypical view of the Miss South Africa pageant, “This pageant gives one woman the opportunity to take personal responsibility and change the rest of her life. People tend to forget this. I guess it’s easier to criticise than to keep track of the good things. The current Miss World is China’s Zi Lin Zhang, a 23-year-old company secretary. She has a degree in business administration, which she obtained from China’s University of Science and Technology in 2006. A formidable athlete, Zi Lin excels in triple jump and hurdles, and also has professional training in the 100m hurdles track event. In addition to her duties as Miss World, she is also gaining popularity in the modelling industry. In 2006, Zi Lin was short listed as one of the top 10 professional supermodels in the Chinese Fashion and Culture Awards. She continues to model in high-profile fashion shows, even strutting the catwalk for iconic designer, Georgio Armani. The Miss World Pageant was launched in 1951 in London, and it remains under the auspice of its founder, Eric Morley, and his family. It started its life as part of the Festival of Britain celebrations. Officially titled the “Festival Bikini Contest”, the British press then dubbed it the “Miss World” contest. Initially, Morley, a former bingo hall manager, had envisioned the event being a once-off only, but, for Eric and his wife Julia, it became their life’s passion to see the event growing from strength to strength. Described as charismatic, Eric Morley was loved and revered by many people from an array of social standings. His ability to mix with the rich and the less-fortunate gained him much respect, both professionally and personally, and even inspired the BBC to televise the Miss World pageant from 1959 to 1979. Thames Television aired the show from 1980 to 1988. At its peak, the show drew an audience of 27.5 million viewers in Britain alone. The pageant, however, has not been without criticism. The show suffered several attacks by feminists groups who saw it as sexist and degrading to the dignity of women. The event actively adopted this new credo and extended its search criteria to find a woman with physical beauty, intelligence and a deep-seated passion for social upliftment. Contestants walked the talk in 1989, for example, when they were quizzed on the then relatively new subject of the ozone layer. That same year, the women were instructed to use anti-animal cruelty cosmetics. Amongst his many achievements, Morley is also famous for his 1946 rags-to-riches venture, Mecca. The London-based small catering and dance company became one of the UK’s top entertainment and catering companies with 15 000 employees covering dancing, catering, bingo, gaming, ice-skating, bowling alleys and discos. The business savvy Morley succumbed to a fatal heart attack on 9 November 2000.